Is it me? Reading the story linked below, a woman found, of all things, a "live" black widow spider in grapes she purchased. See, I would regard that as heartening: no pesticides! Average folks: scared to death! I'd heard about them all my life, from early age, though neither I nor any of my friends had ever seen one while growing up in the Chicagoland area. However, later in life, I found they are common in the Southwest. I built several brick structures out here, over the years, and black widows showed up in every one, in time. How, I've no idea. The eggs, perhaps carried on clothing, blown by the wind, or maybe magic? I have never been bitten, even though I have encountered perhaps a hundred, or so. Had the poor woman found a "dead black widow", the experience would likely have been simply "written off". I killed one in it's web about 2 weeks ago in my garage, left it lying on the floor. In death, shriveling away over time, there was absolutely NO WAY to identify it any longer, much smaller, no coloration left, the red violin no longer possible to discerne. Do orb spiders look at their webs? What methods can poor people use to defend against well equipped oppressors? Never killed one and if I have, it wasn't intentional and I don't know that I did it. Most people are terrified of them. Brown Recluse, as well. With good reason, I suppose, they have a strong venom that can make a person pretty ill and can even kill a child. They don't really bother me much. But I think if I found one in very close proximity to my son... It would be a dead spider in short order. my kids and I have all been bitten by brown recluse spiders. We've all survived and I am the only one with scars memorializing the events. Luckily we were able to move out of the BR infested home we were living in and haven't been bitten since. I have seen plenty of black widows but never had any act like they were going to be aggressive towards me. So never bothered trying to kill one. Australia seems to have a number of spiders that have the ability to harm humans, and if I lived there I would be very wary of such creatures. Most people know, for example, that hippos can be dangerous animals so if one wants to observe them, in the wild, it makes sense to remain inside some form of vehicle that offers protection. Spiders are different because they are small, and often hidden away, so it is possible to disturb them, by accident, and this could lead to an attack. Now I know it is not very "macho" to admit it but I find that a bit scary. I don't know if this last part is true, but I have read that, generally speaking, certain snakes can be aggressive but only if they feel threatened, whereas some dangerous spiders can be intrinsically aggressive and may attack without provocation. some dangerous spiders can be intrinsically aggressive and may attack without provocation. The Australian ones aren't in that category. Well, at least I don't think so. We have redbacks here, but I've never seen a funnelweb - they're over on the East Coast, Sydney and the like. Redbacks bite because they're inclined to favour the same sorts of nooks and crannies that people tend to create for them. Disturbing or damaging their webs counts as provocation to a spider. I actually trod on a white tailed spider in the garden one. Nasty bite - inside my shoe - that I didn't notice until the next day. had to have the foot up for a couple of days after that. Funnelwebs in Sydney are soil based, I always expect that they'd stay in their little funnel things when a big, scary human is tramping around above them. I don't know how they behave if they're out and about when people happen along. The biggest issue is really that people like to go around in bare feet or thongs/ sandals - so they're really putting themselves at risk with ground based spiders. We don't really have all that many dangerous beasties in any one place. You don't find crocs down here in the same areas where you can find redbacks and (in the right season) brown snakes. But brown snakes tend to be pretty timid around people, if you don't bother them they won't bother you, they'll get away quick as a flash. And we don't have big furry things anywhere that can attack us, like bears or big cats can in North America. And just as Americans don't expect to see alligators or desert snakes in places like Oregon, our dangerous critters tend to be regionally focused - jungle, desert, north, south, arid, humid, east, west. Two large predators that really impress me are polar bears and, in Australia, saltwater crocodiles. If one is threatened a bear can normally be frightened off by a couple of rifle shots into the air and it is wise not to swim, or even paddle, where "crocs" tend to lurk. Spiders may not be so dangerous but, in most circumstances, they are harder to spot or avoid! 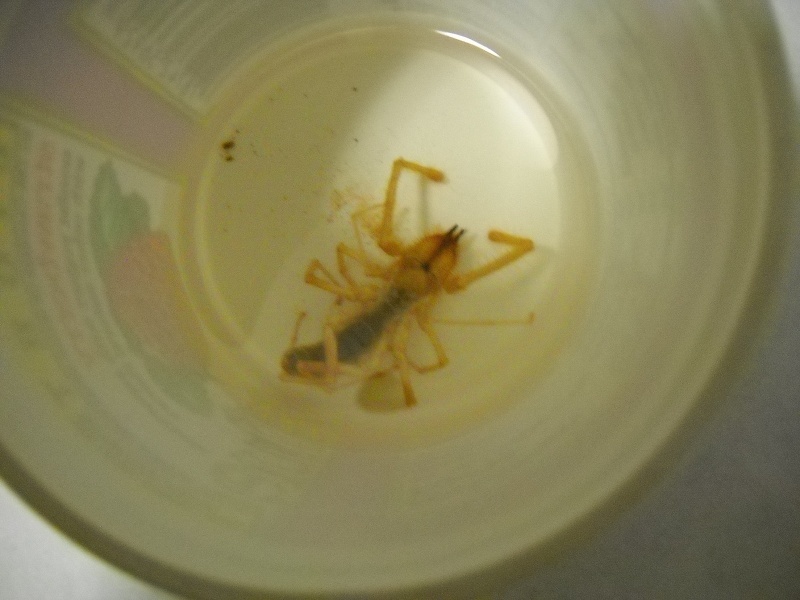 This guy below sitting in the yogurt cup below my keyboard on our kitchen table, is commonly called a Windscorpion, or Vinegaroon. 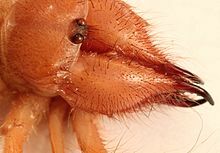 Neither name is correct, "wind", because Indian lore claimed they moved as fast as the wind, and the true Vinegaroon is more scorpion-like having a long tail without a sting, but rather "whips" it's tail forward, propelling a jet of acetic acid as far as several feet, to blind it's quarry. Windscorpion is also locally called Sunscorpion. As you can see by the Lincoln penny, with legs spread out, the guy easily covers a silver dollar-sized area, typical size of those I've encountered, larger were seen in Las Vegas. The bottom pics show his jaws, large, horny material very strong, in Vegas I taunted one with a wooden pencil, upon which it clamped down, unrelentingly, and left deep gashes in the wood! They can bite, but have no venom. My wife, watching the tube in the living room, would be quite displeased if she saw me doing this, though she knows I have it preserved. Story behind it: In September, while she was in Indiana helping her Mom get over colon surgery, I was sitting at the computer desk, which is a corner of the room affair, bare-footed as usual, and though I saw a quick movement on the floor near my feet. Saw a quick shadow underneath the table, then, gone. Got up, got my glasses from the counter island, near-sighted, then saw the little beast perched half on the floor, half on the bottom edge of the baseboard, unmoving. Flyswatter easily dispatched him, as my breathing slowed a bit! Shocked, in 16 months here, we have seen no creatures of any type in the house, except ants. His body is deformed from the death blow, but easily indentifiable still. The bottom pics show the little bitty black eyes on top of the head, and the fearsome jaws, there are 4, which work vertically in pairs opposing one another, to hold their prey. Are you preserving it in epoxy resin, or are my eyes playing tricks on me? It's sitting in 91% isopropyl (rubbing) alcohol. 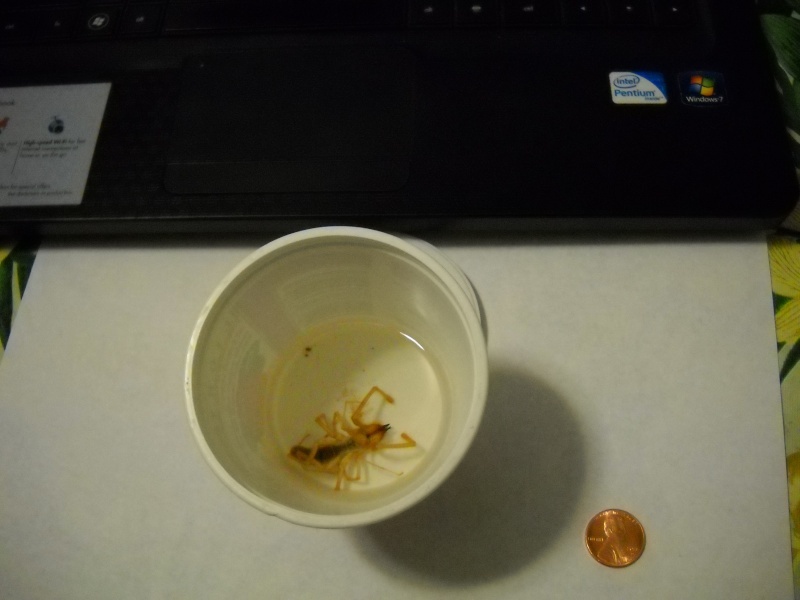 I DID preserve an actual, honest-to-goodness HUGE scorpion in casting resin when I lived in Vegas. I entered the garage there, to find my cat busily engaging in "combat" with some denizen, looked closer, and found he was actively killing a scorpion about 7 inches long! I watched, fascinated, as the cat, somehow naturally more knowledgeable than I, "batted" the dying scorpion with a forepaw, quickly withdrawing it, seemingly knowing this "thing" could hurt him, cleverly avoiding the stabbing probes of the scorpion's tail, until his adversary barely moved anymore, then he rather casually lifted underneath it, as cats are want to do, with his paw, turned it over on it's back, watched, then walked away! I'll never forget that scene! I was a Midwestern boy, saw Disney's "Living Desert" as a child, but never imagined that someday I would experience it firsthand. I had a friend in Melbourne who nearly died from a white spider bite in Melbourne many years ago. It's not the venom, but he became very ill and developed an infection which resulted in a coma, at the time everyone thought it was the venom, but it never was. I don't do spiders. I have such a fear of them, I literally come apart if confronted with anything bigger than a daddy long legs. We live in the Gold Coast hinterlands, at the base of Mt Tamborine, and we have extensive bushland around us and we get everything here. Snakes, spiders and even koalas. We get redbacks, we've had a funnel web come in from the bush and we saw it in the backyard pool .. scorpions and everything in between. I've only ever seen one funnel web here and it was enough to last me a lifetime. I am even more phobic about snakes and we get those just about weekly here in the summer months.. And the snakes we get in the backyard are the browns and blacks. Just nasty. Yeah, they do tend to go away quickly. We have actually redone the fencing around the place to try to reduce the number we get this year - the fence actually goes down into the ground around the property, but they can still come in from under the gate. The problem for me is the kids and our dog. We have to be so careful as the weather warms up. My partner checks the yard each time the kids are to go outside and we can't have anything lying about in the yard, as they get into that as well. Even empty pots have to be stored away properly. And the self watering pots. We had a black snake get into the hole in that once and my god.. I just remember dropping the hose as I was about to fill it up and I ran screaming into the house. So we don't use those pots anymore. Thankfully the dog goes nuts barking if there is a snake in the yard, so it's a good alert system, especially when the kids are playing outside in the backyard. Having said that, it is something that worries me every summer. Because kids play and I want them to play freely in the yard and thankfully they don't have the fear that I do about snakes and spiders, but they do come and tell us if they notice anything that doesn't belong there. We get wallabies, small grey kangaroos and koala's, as well as the obligatory possums. Koalas more so as they migrate around the area during breeding season. The noises they make then though. We do get a lot of redbacks. I've noticed them more near the shed and pool filter. Even under the deck chairs, so we always have to check. I think it depends on where you live as well in Australia. If you have any bushland near cities for example, then you will get snakes. Spiders are just a fact of life here. I don't mind spiders. Most so-called spider bites inNorth America are not spider bites. Spiders are all predators. They prey on other arthropods. If you have a healthy spider in your basement, garage, etc. it means you have lots of spider food scampering about. Spiders are the best pest control out there. seagypsy and jocular like this.